For other uses, see Flywheel (disambiguation). Smoothing the power output of an energy source. For example, flywheels are used in reciprocating engines because the active torque from the individual pistons is intermittent. Delivering energy at rates beyond the ability of an energy source. This is achieved by collecting energy in a flywheel over time and then releasing it quickly, at rates that exceed the abilities of the energy source. Flywheels are typically made of steel and rotate on conventional bearings; these are generally limited to a maximum revolution rate of a few thousand RPM. High energy density flywheels can be made of carbon fiber composites and employ magnetic bearings, enabling them to revolve at speeds up to 60,000 RPM (1 kHz). Carbon-composite flywheel batteries have recently been manufactured and are proving to be viable in real-world tests on mainstream cars. Additionally, their disposal is more eco-friendly than traditional lithium ion batteries. Flywheels are often used to provide continuous power output in systems where the energy source is not continuous. For example, a flywheel is used to smooth fast angular velocity fluctuations of the crankshaft in a reciprocating engine. In this case, a crankshaft flywheel stores energy when torque is exerted on it by a firing piston, and returns it to the piston to compress a fresh charge of air and fuel. Another example is the friction motor which powers devices such as toy cars. In unstressed and inexpensive cases, to save on cost, the bulk of the mass of the flywheel is toward the rim of the wheel. Pushing the mass away from the axis of rotation heightens rotational inertia for a given total mass. A flywheel may also be used to supply intermittent pulses of energy at power levels that exceed the abilities of its energy source. This is achieved by accumulating energy in the flywheel over a period of time, at a rate that is compatible with the energy source, and then releasing energy at a much higher rate over a relatively short time when it is needed. For example, flywheels are used in power hammers and riveting machines. The principle of the flywheel is found in the Neolithic spindle and the potter's wheel, as well as circular sharpening stones in antiquity. The mechanical flywheel, used to smooth out the delivery of power from a driving device to a driven machine and, essentially, to allow lifting water from far greater depths (up to 200 metres), was first employed by Ibn Bassal (fl. 1038–1075), of Al-Andalus. The use of the flywheel as a general mechanical device to equalize the speed of rotation is, according to the American medievalist Lynn White, recorded in the De diversibus artibus (On various arts) of the German artisan Theophilus Presbyter (ca. 1070–1125) who records applying the device in several of his machines. In the Industrial Revolution, James Watt contributed to the development of the flywheel in the steam engine, and his contemporary James Pickard used a flywheel combined with a crank to transform reciprocating motion into rotary motion. 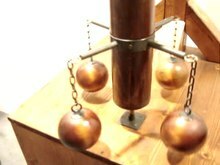 A flywheel with variable moment of inertia, conceived by Leonardo da Vinci. is the moment of inertia of the flywheel about its axis of symmetry. The moment of inertia is a measure of resistance to torque applied on a spinning object (i.e. the higher the moment of inertia, the slower it will accelerate when a given torque is applied). When calculating with SI units, the units would be for mass, kilograms; for radius, meters; and for angular velocity, radians per second and the resulting energy would be in joules. Increasing amounts of rotation energy can be stored in the flywheel until the rotor shatters. This happens when the hoop stress within the rotor exceeds the ultimate tensile strength of the rotor material. is the angular velocity of the cylinder. Flywheels are made from many different materials; the application determines the choice of material. Small flywheels made of lead are found in children’s toys. Cast iron flywheels are used in old steam engines. 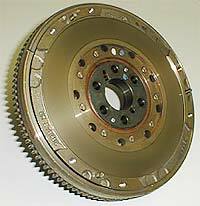 Flywheels used in car engines are made of cast or nodular iron, steel or aluminum. Flywheels made from high-strength steel or composites have been proposed for use in vehicle energy storage and braking systems. The efficiency of a flywheel is determined by the maximum amount of energy it can store per unit weight. As the flywheel’s rotational speed or angular velocity is increased, the stored energy increases; however, the stresses also increase. If the hoop stress surpass the tensile strength of the material, the flywheel will break apart. 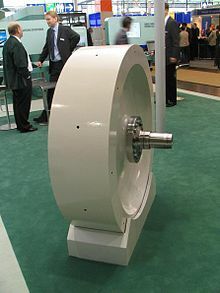 Thus, the tensile strength limits the amount of energy that a flywheel can store. In this context, using lead for a flywheel in a child’s toy is not efficient; however, the flywheel velocity never approaches its burst velocity because the limit in this case is the pulling-power of the child. In other applications, such as an automobile, the flywheel operates at a specified angular velocity and is constrained by the space it must fit in, so the goal is to maximize the stored energy per unit volume. The material selection therefore depends on the application. The table below contains calculated values for materials and comments on their viability for flywheel applications. CFRP stands for carbon-fiber-reinforced polymer, and GFRP stands for glass-fiber reinforced polymer. The table below shows calculated values for mass, radius, and angular velocity for storing 500 J. The carbon-fiber flywheel is by far the most efficient; however, it also has the largest radius. In applications (like in an automobile) where the volume is constrained, a carbon-fiber flywheel might not be the best option. For comparison, the energy density of petrol (gasoline) is 44.4 MJ/kg or 12.3 kWh/kg. could be called the specific tensile strength. 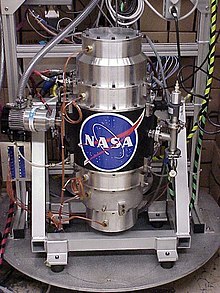 The flywheel material with the highest specific tensile strength will yield the highest energy storage per unit mass. This is one reason why carbon fiber is a material of interest. Assume the spokes, shaft and hub have zero moments of inertia, and the flywheel's moment of inertia is from the rim alone. A shaftless flywheel eliminates the annulus holes, shaft or hub. It has higher energy density than conventional design. But the flywheel requires specialized magnetic bearing and control system. the density. Typical flywheel has a shape factor of 0.3. Better designs, such as the shaftless flywheel, have a shape factor close to 0.6, the theoretical limit is about 1. ^ "10 Need-to-Know Tech Concepts for 2012". popularmechanics.com. 3 January 2012. Archived from the original on 11 November 2013. Retrieved 2 May 2018. ^ "Flywheels: Iron vs. Steel vs. Aluminum". Fidanza Performance. Archived from the original on 10 October 2016. Retrieved 6 October 2016. ^ Ashby, Michael (2011). Materials Selection in Mechanical Design (4th ed.). Burlington, MA: Butterworth-Heinemann. pp. 142–146. ISBN 978-0-08-095223-9. ^ Totten, George E.; Xie, Lin; Funatani, Kiyoshi (2004). Handbook of Mechanical Alloy Design. New York: Marcel Dekker. ISBN 978-0-8247-4308-6. ^ Kumar, Mouleeswaran Senthil; Kumar, Yogesh (2012). "Optimization of Flywheel Materials Using Genetic Algorithm" (PDF). Acta Technica Corviniensis-Bulletin of Engineering. Archived (PDF) from the original on 1 November 2015. Retrieved 1 November 2015. ^ "Flywheel Energy Storage, UPS, Battery-Free, Active Magnetic Bearing, Magnetic Bearings, Kinetic Energy, Magnet Motor Generator, Bi-Directional Power Converter - Calnetix". www.calnetix.com. Archived from the original on 1 November 2017. Retrieved 2 May 2018. ^ "Flywheel Energy Calculator". Botlanta.org. 2004-01-07. Archived from the original on 2011-07-25. Retrieved 2010-11-30. ^ "energy buffers". Home.hccnet.nl. Archived from the original on 2010-11-26. Retrieved 2010-11-30. ^ "Message from the Chair | Department of Physics | University of Prince Edward Island". Upei.ca. Archived from the original on 2010-04-30. Retrieved 2010-11-30. ^ "Density of Steel". Hypertextbook.com. 1998-01-20. Archived from the original on 2010-11-25. Retrieved 2010-11-30. ^ Li, Xiaojun; Anvari, Bahar; Palazzolo, Alan; Wang, Zhiyang; Toliyat, Hamid (2018-08-14). "A Utility Scale Flywheel Energy Storage System with a Shaftless, Hubless, High Strength Steel Rotor". IEEE Transactions on Industrial Electronics. 65 (8): 6667–6675. doi:10.1109/TIE.2017.2772205. ^ Li, Xiaojun; Palazzolo, Alan (2018-05-07). "Multi-Input–Multi-Output Control of a Utility-Scale, Shaftless Energy Storage Flywheel With a Five-Degrees-of-Freedom Combination Magnetic Bearing". Journal of Dynamic Systems, Measurement, and Control. 140 (10): 101008. doi:10.1115/1.4039857. ISSN 0022-0434. Look up flywheel in Wiktionary, the free dictionary. Flywheel batteries on Interesting Thing of the Day.